Are children missing out on anything if their family chooses not to have a television? These days television is so much part of our lives that it's unusual for families not to have one. However, it's merit (or lack of) is often a topic of debate in educational and developmental psychology circles as to whether it's beneficial for children. Various arguments include that it stifles creativity, encourages violence (in vulnerable children if their viewing habits aren't monitored) and is a contributing factor towards the escalating rates of child obesity (as some children spend hours zoning out in front of the screen instead of actively playing outdoors). In a nutshell, do you think television should be a part of every child's life, and do you think that they're missing out on anything if their families chooses not to have one? Do you personally believe that they stifle creativity, encourage violence, expose children to inappropriate language and behaviour, and contribute to child obesity? I know of a family who have 5 children and no TV, and I really admire them for that. Their children have a great childhood and spend a lot of time outdoors and doing hands on activities. I don't believe that children miss out by not having a TV. Childhood is such a short period and I believe TV should not be a dominating element. Television can be a great tool for learning, but definitely in moderation. I really have to limit my children's electronic time, to make sure they spend other time doing more active pursuits. As well as all the crap that's on tv, there are lots of good things too. Children would miss out of a lot of wonderful children's shows and educational programmes. There are still plenty of other ways to keep them entertained and teach them though. If a child who is used to television had it taken away, then I think they would be missing out, but if you don't expose children to television from the start, then I don't think they'd miss it that much. The only problem comes in when they go to friends who have TVs; then they'd feel like their missing out. And what about movies, are trips to the cinema included in this? No, I think it is almost not fair to not have a television. I think it is important to hear about everyday events, as do not think kids would read the news however if it is on on TV and the parents are watching, they may take some in. I think they will be more on their computers also if they have no TV. I do not believe in unlimited TV for children however I believe TV has a good place in the life of children and it helps them learn. Too much TV would no doubt stifle creativity, conversation and family life, but in moderation I think it's fine. We only have 1 TV in our house and this helps to ensure TV does not overtake our lives. All good things in moderation. One of Australia's leading paediatricians has never permitted a TV in his home. All his children are so well adjusted, competent and self-confident that they could be role models for their generation. Of course no TV may not necessarily be the reason that they are so competent but it certainly did not do them any harm. It think the problem with denying anyone anything is that they then desire it more. So, take away TV and when they visit friends houses or relatives, they're going to be wanting to sit in front of their TV. Also, kids will just turn to other devices if they have no TV. I think that, like most things, in moderation TV is a good thing. We used to have set times for TV at night and the kids just knew that there was no point trying to push the boundaries because they'd end up missing out the next night. There's certainly a lot of rubbish on TV that you wouldn't want your kids to watch but there's really good stuff too. Overall, I think that moderation is the key and set boundaries - it's called parental control! I spent my childhood addicted to TV, and I mean seriously addicted. From age six to seventeen, I spent six to sixteen hours a day laying in front of the tube. If there was nothing good on, I would watch crap I didn't even find interesting, or pop in a movie on VHS. My mom and I used to have 'quality time' in front of the TV, in the evenings and although I did appreciate the time together, it was still more TV time. Now as an adult, I have a TV but I don't have cable. I know if I did have cable, I would be addicted all over again and I don't want that. Don't get me wrong, I still love TV;I wouldn't have started this hub if I didn't. But I understand that moderation is important and streaming services like Netflix allow me to moderate how much I watch instead of just having the TV on because it's there. I've played both sides of the fence, and I know I would have no problem with having kids in my home and no TV. Maybe a little but its not like they will be scarred for life because they didnt watch TV. There is so much other fun stuff to do. Children also exhibit greater creativity and adventure when they play. 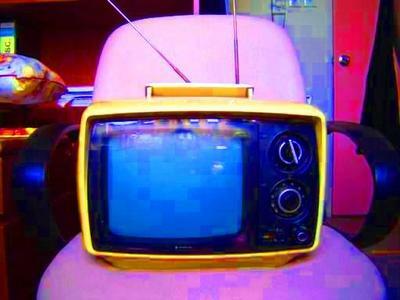 Could you live without television? Do you think the scenarios on Reality TV are staged? Do you prefer historical dramas or those set in the present day? Would you ever apply to be on a reality TV show?